It's been a rough week, but I did have some time to take my first stab at hand-made pasta. I learned the basics in a Master Chef Class I had the privilege to take last month at the Foodservice Educators Network International (FENI) conference. I did not actually make pasta in the class, but it certainly helped to watch the Chef make it and listen to her describe the process as she made the most delicious stuffed pasta dishes it has been my pleasure to taste. Overall, I am pleased with my results. I rolled the pasta out as thin as I could, and it did get quite thin, but it absorbed a lot of the water and expanded during the cooking. It was perfectly al dente, and held up well to the sauce. I kept the sauce simple. I broke the ends off of asparagus spears and simmered them in water for a quick stock, and then I blanched the tips. I sauteed a large sliced shallot in a mix of butter and olive oil, added the asparagus broth, and cooked it down. When it was about ready I boiled the pasta for about two minutes. 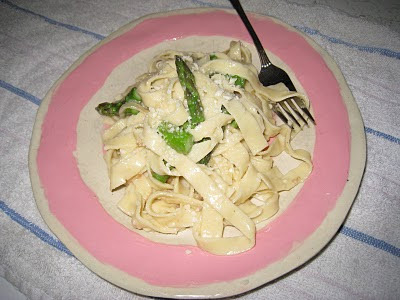 I added the asparagus tips to the sauce just as the pasta was done, and then I added the pasta to the sauce as well, along with about a quarter cup of grated Pecorino Romano cheese. I will definitely be playing with pasta again. Once I have had more practice and a better understanding of how it works, I will share my new-found knowledge with you. Beautiful pasta. I would love to try and make. Thank you so much, MaryMoh! It was really easy and very little fuss. Please check back - once I have made it a few more times and have a good handle on it I plan to post the recipe and a tutorial.